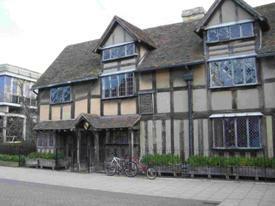 Visiting Shakespeare's Birthplace? We have teamed up with the Shakespeare Birthplace trust to offer a discount on entry to the Birthplace Trust properties when you hire bikes. What better way to visit the Shakespeare Houses! Gently cycle round the town houses of The Birthplace, Halls Croft and New place. You can also stop off at the Guild Chapel, Harvard House and the Holy Trinity Church before heading out along the lanes and the National Cycle network to Anne Hathaways Cottage and Mary Ardens House. When hiring a bike we can provide you with a voucher entitling you a 30% discount for entry to all 5 houses. Just call for details.